I have a shiny new allotment of auqaponics real estate! With a huge amount of help from Mrs. 120 Things, we added two submerged sections of 90mm PVC as inlet and outlet drainage media screens. We also cut holes in the top of one end of the BYAP grow bend to allow water in from the fishtank, and the bottom of the other end to allow a standpipe to be fitted. Then we fitted the standpipe. Basically a short length of pipe that sets the depth the water will sit at, by draining the growbed from the top of the pipe, out through a hole in the growbed. Or in normalspeak, a plug with a tube stuck in it. Working with a purpose built growbed with purpose built media is soooo much nicer than working with home made stuff. I'm all for tinkering and DIY, but if you just want a garden, this pre-made stuff is great. 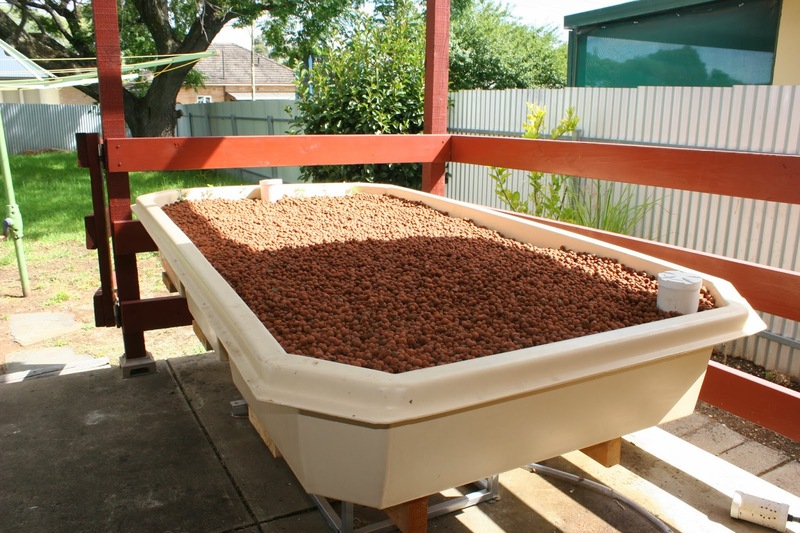 I have no connection with Backyard Aquaponics other than existing on their forum* (as BullwinkleII), but having bought one of their growbeds (second hand), I feel very comfortable recommending them. * and winning my pump and some other stuff in one of their photo competitions.